With more than 3 million passengers disembarking in Barcelona every year the port has become Europe’s busiest cruise ship destination. Due to the volume of traffic there are a number of docks where ships might arrive but the vast majority drop anchor at either Moll Adossat or next to the World Trade Centre. Moll Adossat: Standing approximately 3km south of Plaça de Colón at the end of the Ramblas this is the busiest dock for cruise ships which berth at Terminals A, B, C, and D. There is a blue shuttle bus named ‘T3-Portbus’ which runs back and to between the port and the Columbus Monument at Plaça de Colón. You buy tickets on board the bus. The long and unpleasant walk from Moll Adossat into the city is not recommended. World Trade Centre: A much smaller number of vessels dock at the North, South or East terminals which are located next to the World Trade Centre. This is a far more convenient arrival point for passengers as it lies just a short stroll from the end of the Ramblas without need for further transportation. It also offers the convenience of a bus stop for the city’s popular hop-on, hop-off tourist bus and public transport services. If you’re looking for a luxury hotel near Barcelona Port look no further than the 5-star Hotel Eurostars Grand Marina (Moll de Barcelona) for your overnight stay. Walking: The T3-Portbus from Moll Adossat will drop you at Plaça de Colón at the end of the Ramblas which is the city’s best known street. You can walk to this same point in a few minutes if your ship docks next to the World Trade Centre. From here it’s easy to walk the full length of the Ramblas as far as Plaça de Catalunya and to stray off into the Gothic Quarter. However, if you want to see more of the city’s great sights including the Sagrada Familia you’ll need to use some form of transport. Public Transport: Bus and metro services around the city are excellent and cover all areas where tourist attractions are located. If you’re in the city for long enough and reckon on making at least ten journeys on public transport you should buy the T-10 travel pass which works out cheaper than paying for ten individual journeys. Black and yellow taxis are all over the place and charge according to official meters. Distances involved and volume of traffic make them the least economic way of getting around. Hop-on, Hop-off bus Tourist Bus: Probably the most popular and efficient way to get around the city’s main attractions is on this excellent bus service which has stops at both the World Trade Centre and at the Christopher Columbus monument in Plaça de Colón. Otherwise you can walk up the Ramblas to Plaça de Catalunya and begin your journey from there. Please note that there are two routes: a West Route and an East Route. They do not have the same stops but there are certain points where you can change buses to join the other route. The two stops nearest the port are on the West Route which does not include the Sagrada Familia. Mirador de Colom: If your cruise ship docked at Moll Adossat (Terminals A to D) you will most likely take the blue T3 Portbus shuttlebus to Plaça de Colón at the end of the Ramblas. The main landmark here is the Columbus Monument which was constructed for the Universal Exhibition in 1888 in recognition of the great explorer having sailed to Barcelona on his return from the Americas. The statue depicts Columbus holding a navigational chart and pointing in the direction of America. There’s a lift inside the monument which takes you to a viewing platform at the top which affords great views along the coast and over the city. Las Ramblas: If you’re doing some exploring on foot you’ll most likely wander on to the Ramblas which is the city’s most famous thoroughfare. It runs 1.2km to the north-west as far as Plaça de Catalunya and is packed with street artists and stalls selling flowers and newspapers. Be very careful here as the sheer quantity of people strolling around makes it a pickpocket’s paradise. Gran Teatre del Liceu (La Rambla, 51-59): As you’re walking along the Ramblas look out for the city’s impressive Opera House which lies about half way along on the left. This venue initially opened its doors in 1847 but has twice been rebuilt as a result of fires. A guided tour of this prestigious theatre is available, otherwise you cold check at the box office to find out what performances are taking place if your itinerary allows for an overnight in Barcelona. La Boqueria (La Rambla, 91): Continuing your walk along the Ramblas towards Plaça de Catalunya you’ll come to Mercat de Sant Josep de la Boqueria (also on the left) which is the city’s most famous market. In spite of its location in the heart of the tourist centre, it is frequented by locals who use it to buy their fresh fruit and vegetables as well as fish and meat products. Even if you’ve no plan to buy anything it’s worth a visit just to browse the colourful stalls or to stop for coffee with a slice of tortilla de patatas at one of its lively cafés. Cafè de l’Òpera: (La Rambla, 74): Speaking of cafés, look out for this iconic café on the opposite side of the Ramblas shortly after you’ve seen the Opera House. This historic venue serves great coffee with croissants or sandwiches and hasn’t closed since it serving its first customers in 1929 and that includes surviving the Spanish Civil War. Barri Gòtic: The Gothic Quarter of Barcelona lies east (to the right) of the Ramblas as you’re walking from the port towards Plaça de Catalunya. It represents the old city of Barcelona and in spite of its appearance which consists of a labyrinth of small streets it is quite safe to wander around but you should again protect against pickpockets. Highlights of the area include Barcelona Cathedral (Plaça de la Seu), the Museu Picasso (Carrer Montcada, 15-23) and Plaça Reial which is home to some attractive restaurants including the popular Les Quinze Nits (Plaza Real, 6). The best known restaurant in the area is probably the historic Els Quatre Gats (Carrer de Montsió, 3) which in its time was a regular haunt of some of the city’s modernist characters including Antoní Gaudí and Pablo Picasso. Plaça de Catalunya: At the northern end of the Ramblas you’ll eventually come to this large square which is a focal point for the whole city. It is surrounded by department stores including Fnac (No. 4) and the enormous Corte Inglés (No.14) which is next to the bus stop for the hop-on, hop-off tourist bus. Below the square is the impressive Tourist Information Office (No. 17-S) with its multi-lingual staff who can provide a wealth of information about the city. Passeig de Gràcia: If you wish, you can continue to walk from Plaça de Catalunya into the prestigious Passeig de Gràcia which lies on its northern side opposite the Ramblas. However, this is quite a lot of walking especially when you’ll have to make your way back to the port eventually so I’d suggest you now consider using public transport or the hop-on, hop-off tourist bus as you travel further afield. This exclusive avenue connects Plaça de Catalunya with the bohemian district of Gràcia further north. It is home to some of the city’s most exclusive hotels, a plethora of designer shops and plenty stylish cafés. From the tourist point of view it is a major attraction thanks the location here of Casa Batlló (Passeig de Gracia, 43) and La Pedrera (Passeig de Gracia 92) which are two of Gaudí’s best known works. Both are listed by UNESCO as World Heritage Sites. 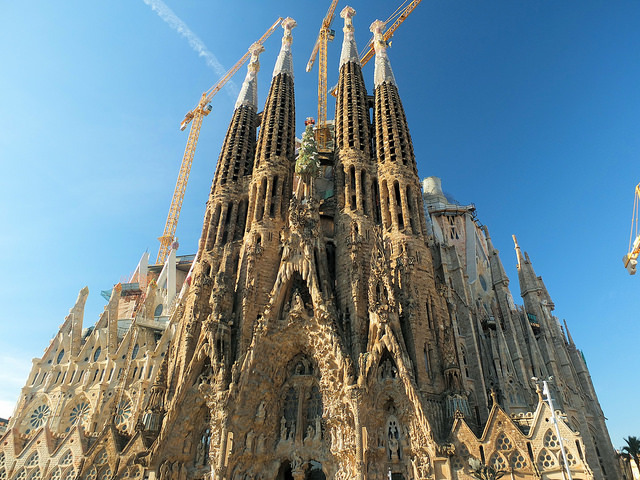 Sagrada Familia (Calle Mallorca 401): In total there are seven of Antoni Gaudí’s works around Barcelona which are recognised by UNESCO yet it is the irrepressible Sagrada Familia which has become a symbol of the city. Gaudí worked on the project from 1883 until his death in 1926 when only about a quarter of it was complete. Subsequent architects who worked on the building were unable to follow Gaudí’s original plans as they were destroyed by fire during the Spanish Civil War. Currently there are plans in place to complete the Basilica by 2026 which would mark the hundredth anniversary of the Catalan architect’s death. Cruise ship passengers can create a small group and pre-book a private city tour of Barcelona with fast track access to the Sagrada Familia. Park Güell: Originally it was envisaged that this site located to the north of Gràcia would serve as a Garden City containing 40 detached houses overlooking the city. In the end only two were built and the architect lived in one of them. 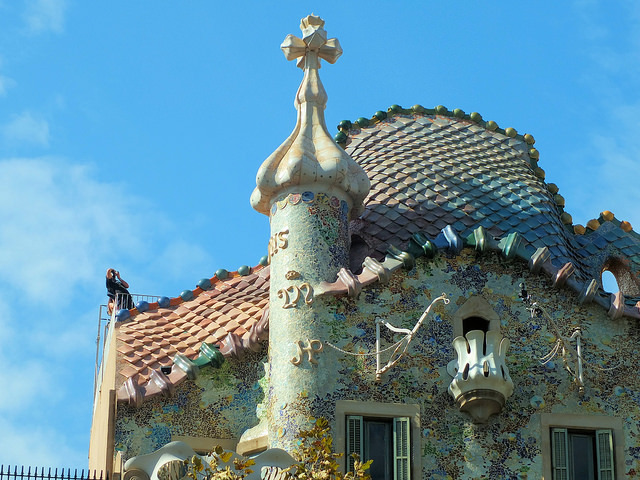 Today this public park is regarded as one of the city’s main Gaudí attractions where the Art Nouveau gatehouse and the giant ceramic lizard have become iconic images of the city. Cruise ship passengers would be best advised to get there by using the hop-on, hop-off tourist bus service which has a stop here. Nou Camp Stadium: Another popular stop on the hop-on, hop-off bus route is the home of FC Barcelona, one of Europe’s greatest football teams. With a capacity of almost 100,000 this is the largest stadium in Europe which hosts league matches on alternate weekends and Champions League games in the midweek during the season (August to May). The stadium’s football museum (and stadium tour) is the most popular in the city with around 1.5 million annual visitors. Museums: After the football museum the other most visited museum in the city is the Picasso Museum (Carrer Montcada, 15-23) but there are so many other places which merit a visit that you simply won’t have time to do them justice during your time in port. Highlights of the rest include MACBA (Museu d’Art Contemporani), MNAC (Museu Nacional d’Art de Catalunya) and the Fundació Joan Miró. 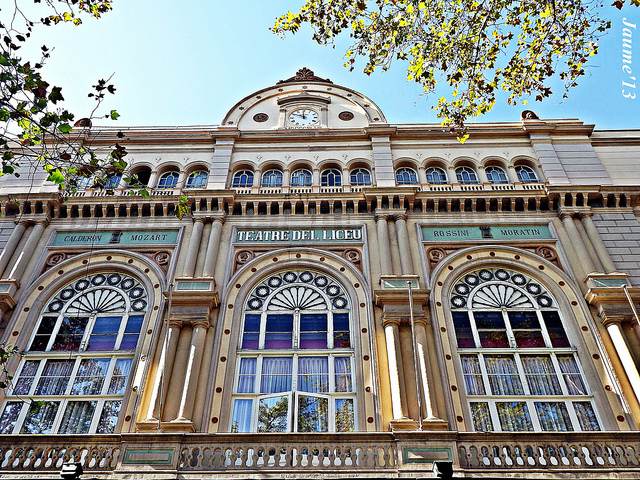 Besides the Liceu Opera House this historic concert hall is one of the other main cultural venues in town. They host an impressive calendar of events throughout the year so if you’re planning on an overnight in Barcelona you might want to check out what’s going on here whilst you’re in port. Search All Shore Excursions from the Port of Barcelona. Many cruise ship passengers visiting Barcelona are doing so for the first time in which case there’s absolutely no need to look at what excursions are available outside the city as there’s so much to see and do in it. If, however, you’ve been here before and are looking for something different there are a number of trips beyond the city which will often be made available by official shore excursions by your cruise line. Alternatively, you can arrange for private tours with local operators or take a chance at getting around on the excellent public transport network. 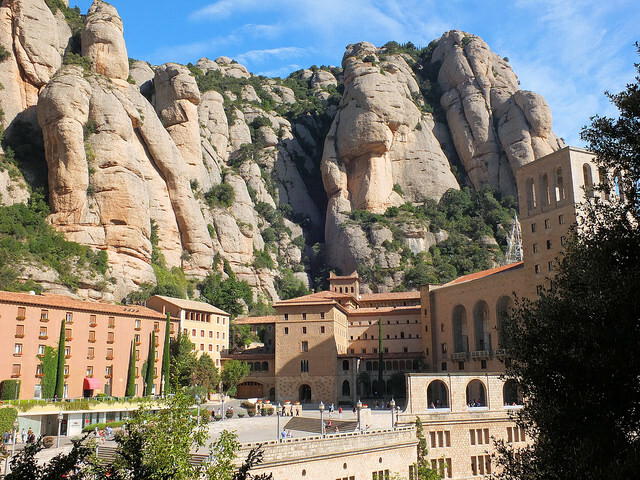 Montserrat: The most popular excursion is to the Benedictine Monastery of Montserrat which lies in the mountains some 55km north-west of Barcelona Port. This is an important site for the people of Barcelona which is home to a black icon of the Virgin of Montserrat (La Morenita) who is the Patron Saint of Catalonia. If you aren’t taking a private tour to Montserrat you can get there by train from Plaça d’Espanya station. Departures are frequent, the journey takes about an hour and your ticket includes the trip up the mountain by funicular or cable car. Private tours to Montserrat for cruise ship passengers are available with a stop at Gaudí’s Park Güell on the way. Barcelona Airport: If your cruise begins or ends in Barcelona you’ll probably be flying in or out of Barcelona’s El Prat Airport. Located just 17km south-west of the Barcelona Port the airport is easily accessible by public transport (Aerobus or train). However, considering the luggage you’ll be carrying you’re better off travelling by taxi or arranging a private transfer.